When I thought about writing this blog, I imagined it would open with a beautiful, inspirational Scripture followed by a suspenseful, but not too lengthy, build up and then finally the climax. But I’m terrible at surprises, so that’s all out the window. Today I am 8 weeks pregnant. Even this early on, we are seeing God’s blessings and I’m definitely realizing the truth when people say every pregnancy is different. We are so thankful and privileged to have been able to skip the “trying” phase of “let’s have another baby.” Basically we tried and BAM, it happened. Two weeks later we saw two lines. Thank you God. One of my prayers was that He would bless again quickly and that if we didn’t have to wait, He wouldn’t make us. Prayer answered! I have also been thankful beyond words that my anxiety has seemingly (knock on wood) disappeared. In the months leading up to “trying” (because we knew September would be the time) I had severe anxiety attacks. I was afraid of everything. I was afraid I would be in a car wreck or that Tim would die in his sleep or any time he was away from me. I was afraid we wouldn’t be able to get pregnant quickly and I would experience the pain that so many of my friends have (and still do) experience. I was afraid for our future children and their health. Basically everything had me freaked out. Then one day, 10 days before conception, in the middle of fighting off a panic attack, a friend came and prayed over me. She specifically prayed that the fear would leave me and that God would show me in a dream that everything would be okay with my next baby. Since that day, I have not had even the beginning of an attack. I’m claiming a miracle with this one! Thank you God! When I was in high school I started having dreams about babies. I had maybe one or two a year and they continued until I got pregnant with Pippy. Every time I had a dream about a baby, the baby was always a girl and she always died. When I remember some of those dreams now, I can still see the face of that baby girl and the various dreams I had with her. Thankfully, those memories were blocked while I was pregnant with Pippy and the baby in my dreams didn’t resemble Pippy. Then when I got pregnant and we found out Pippy was sick, I started having dreams about a baby boy, a perfect baby boy. I thought those dreams meant that I was carrying a boy and that God would heal him and we would get that miracle. Hence, when the doctor said “it’s a girl” I was shocked and if I’m being totally honest, I was disappointed. I started to be very confused by dreams. So I put out a fleece. I prayed that God would reveal to me Pippy’s life in a dream, whether she would live or die, and that He would confirm that dream by giving Tim the same dream on the same night. Well, no more dreams. Seriously, literally, no more dreams until after Pippy was born and passed. After she passed, I had one dream about my beautiful baby girl. She was a toddler and we were going to garage sales together. Yes, my fantasies involve finding the best deals on new treasures. Then about a month later, that baby boy was back in my dreams. He is the same baby boy and in every dream we say his name or tell someone his name. His name is Liam and he is perfect and has dark curly hair. My mom had a dream while I was pregnant with Pippy. I had not shared all the details of my dreams about the baby boy with her, so she didn’t know his name or what he looked like. So my mom calls me one day and says, “I had a dream about you last night. You were in a hospital bed and had just had a baby. Crawling across the foot of the bed was a little boy about 2 years old. He had dark curly hair and you were saying ‘Be careful, Liam. '” Ummm, goosebumps. Two weeks ago I attended a women’s retreat with my church. One morning at breakfast one of the ladies came up to me. We know of each other at church, but we’ve never really talked more than just to say hello in passing. She came up and said she had been debating telling me something because it was very weird. I encouraged her to tell me and was surprised by what she said. She told me, “About three months ago, I had a dream about you and your husband, which is weird because I don’t know you. It was a good dream, which is also weird because I don’t have good dreams…ever. My dreams are always bad. But in this dream I was in a park and you and your husband were walking toward me. He had a little boy on his shoulders and you were carrying a new baby and you just looked so happy.” She continued to tell me when she woke up she was in tears and so happy for us and that she just prayed for us until she fell back to sleep. The day that my friend prayed for me, that night I dreamed about Liam again and as usual he was perfect. I’m only 8 weeks along right now, so it will be some time before we find out if I’m carrying baby Liam right now or not. I believe I am. The dreams I have had and the confirmation through other people help give me peace that this baby will be healthy. Of course, I don’t want anyone to think I’m claiming to see the future or I know this for a fact. There is a 50/50 chance with the gender of this baby and less than 1% chance that this baby will be sick. But only God knows for sure and we will just wait for Him to reveal it all to us. And now back to more blessings! “Feeling pregnant” and all the symptoms that go with it, give me peace of mind that this baby is still kicking around in there. But they are not fun. Nausea. Ugh! I had the slightest bit of nausea with Pippy, which was easily controlled with a few crackers. This time I’m nauseated all day. It’s not unbearable, just enough to feel yucky. And thank God it ends there and so far I’ve missed the full morning sickness experience. Irritability. Watch out people, Jessica is cranky! Sorry world, but I seem to be more on edge and quicker to “just not give a crap cause I don’t feel good and everyone can just kiss my booty.” I’m trying really, REALLY hard to keep this from showing on the outside, but according to some people I’m failing. I’m trying though. Hot Flashes. For real, I can’t find a temperature that makes me comfortable. I’m either burning up or freezing. Once again, thank you hormones. Heightened Sense of Smell. This one is kinda like a fun circus trick. The other day I walked into my brother-in-laws house and immediately smelled dill pickles…that were in the jar…in the fridge. I walked in the house and without pausing went straight to the fridge. I may have awoken the Pickle Beast though. The other night I ate a jar of whole dill pickles…and then dunked dark chocolate Milano cookies in the juice. I know! Tim laughed and gagged. But seriously it was so delish! And now you’re up to date with this pregnancy and probably a little more informed than you really wanted to be. 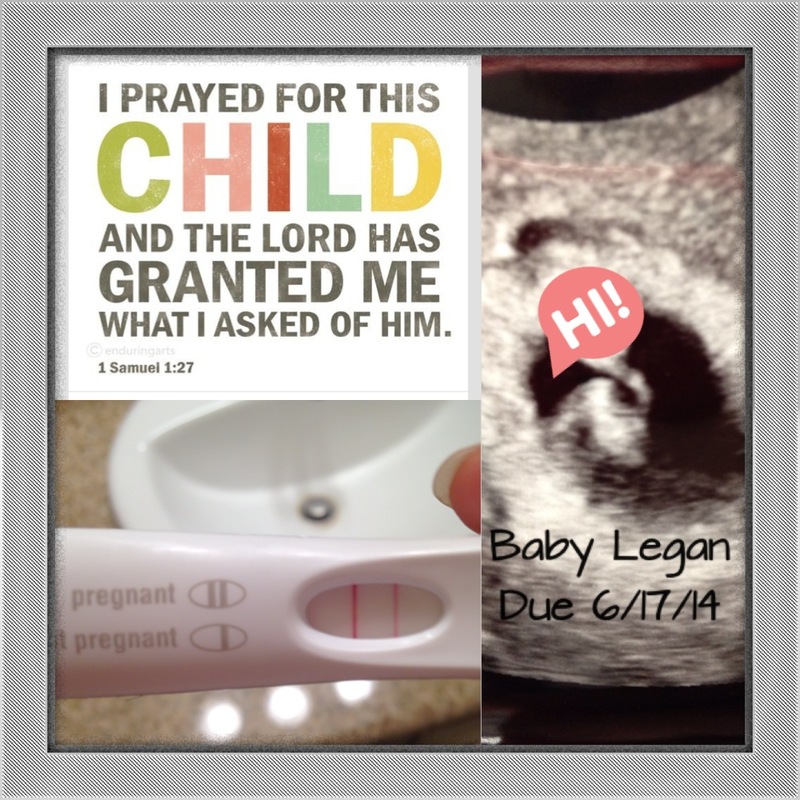 Our next doctor appointment is in a few weeks and we should have another picture of Baby Legan to share. In the meantime, please continue to keep our family in your prayers. Please pray for a healthy baby and a healthy pregnancy and that Tim and I will continue to trust God’s plan for our family and not allow Satan to instill fear in us. You are an amazing young woman!! Just absolutely happy for you! Oh Jessica! I have goosebumps and chills and tears in my eyes! I am so happy for you and may God give you and your family happiness and love! Silly me, I cried and laughed at this round, you small family will be in our prayers. May God continue to bless you and that you may find the peace that only He can give. I’m so happy for you both! Wonderful news!